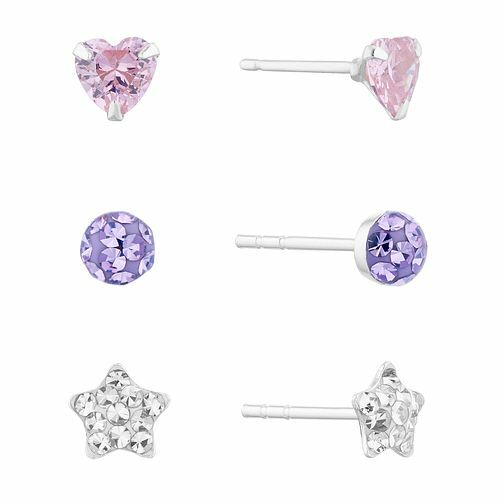 This sparkling set of 3 shaped stud earrings are a cute and colourful way to accessorise your look. Made from sterling silver, these crystal and cubic zirconia earrings feature a pair of pink cubic zirconia hearts, a round purple design adorned with round purple crystals, and sparkling silver stars also adorned with shimmering crystals. Ideal for treating yourself or a loved one to, presented in a cute pink heart shaped box. Sterling Silver Crystal & Cubic Zirconia 3-Set Stud Earrings is rated 5.0 out of 5 by 5. Rated 5 out of 5 by Anonymous from This product is an ideal present. I bought this for my grandaughters Christmas and she is delighted. Three very nice sets of ear-rings. Excellent value for money.